Properties in Bay Harbor Islands average 4.4 out of 5 stars. Ultra Modern Luxurious Townhome few minutes walk to the beach long term . Property 2: Ultra Modern Luxurious Townhome few minutes walk to the beach long term . Property 3: Bay Front - 'Villa La - Vue', Incredible Bay & Golf Course Views! Sleeps 15. Property 6: CONTEMPORARY 1 BEDROOM w/ OCEAN & INTRACOASTAL VIEWS!!! Excellent Beach Location! - 1-Bedroom Resort Suite - Free Daily Cleaning. Property 9: Excellent Beach Location! - 1-Bedroom Resort Suite - Free Daily Cleaning. Property 10: Tropical Home near Aventura Mall and the Beaches. Heated Pool. The Beach Is Yours. Nice Studio in a Vacation Hotel environment. Property 13: The Beach Is Yours. Nice Studio in a Vacation Hotel environment. Property 14: Tropical Secluded Paradise with Heated Pool Near Beaches and Aventura Mall. Property 22: North Miami Beach villa with pool & grill. Ideal for families! Minutes to beach! OCEAN VIEW Studio Directly ON THE BEACH + POOL ! Property 26: OCEAN VIEW Studio Directly ON THE BEACH + POOL ! Beautiful Waterfront View w/ Pool, BBQ's, HDTV, WiFi, PARKING, Walk to Beach! Property 27: Beautiful Waterfront View w/ Pool, BBQ's, HDTV, WiFi, PARKING, Walk to Beach! Beautiful Condo Ocean Front on Hollywood Beach !!! 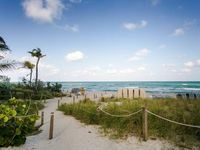 Property 32: Beautiful Condo Ocean Front on Hollywood Beach !!! Great Beach Apartment in desirable Sian Residence! Property 36: Great Beach Apartment in desirable Sian Residence! Amazing/Direct Ocean Front/Huge Balcony/Endless Views/Kitchen - NEWLY RENOVATED! Property 38: Amazing/Direct Ocean Front/Huge Balcony/Endless Views/Kitchen - NEWLY RENOVATED! 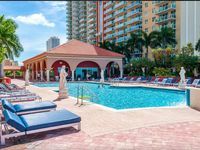 Property 46: Beautiful Condo Ocean front on Hollywood Beach !!! Rating Details: The property manager was very helpful. The vacation rental was spotless. I was very happy with the location. I was very satisfied with the condition of the vacation rental. Overall, I recommend this vacation rental. Reviewer Comments: We stayed in this unit for one week in April. The condo was just like the pictures. It was clean and spacious. There were 2 huge closets in the bedroom and the en-suite bathroom was large. I was very happy to see that there were lawn chairs and beach towels for our use. This was a big plus. The kitchen was fully stocked with blender, toaster etc. The ice maker worked! (I have been to many conditions where they don&amp;#x2019;t.). The unit is on the 15th floor, but the elevators were never a problem. The building was clean and safe. I used the workout room every day and was happy with the equipment and the availability of the machines. The building is on the beach but behind another building. This was never a problem as you could not even tell until you walked by it on the way to the beach. It did not distract your view as your view was from the side of the building. Eileen was an attentive host. Two bed. Two bath unit came equipped with plenty of towels and a working dishwasher/ wash./ dryer. Dryer vent needs to be cleaned out. Kitchen was well appointed and easy to use. Again the view from master, dining, and living room was amazing. Corner unit on 6th floor felt more private. There are 795 units in this apartment complex. Halls are spotless. no smart tv. Eileen helped us connect the tv to the surround sound speakers. Layout was nice and very comfortable. Plumbing was not functioning well when we arrived on a Monday. Kitchen sink faucet running, both toilets had problem. Maintenance men came and worked on stuff, but it took almost our whole stay for them to resolve one of the issues. Place was nice enough and we would like to return. Close to beach and Oleta River state park with kayak rentals.